Yes, yes, yes, finally! I'm leaving tomorrow for a three-week vacation at the seaside, that we've all been waiting for so long. Goodbye to the heat in the city, from tomorrow I'll be breathing fresh salty air, soaking my sore feet and arms in refreshing, gorgeously blue water. Even on windy days like we had last year. Well, since I was extremely busy in the last 15 days, and the heat was unbearable, my fridge resulted still quite full this morning. So I put myself to work early and baked, baked and baked. Some of this stuff will go into the freezer and wait till we get back, and the rest is coming with us, for the travel and to have something for breakfast and kid's snacks in the next few days. These however, I virtually dedicate to a friend blogger and Bakespace peep, Danielle. She has already tried my recipe once, and when I started blogging her first question was whether I was going to blog about these. So here you are, Danielle. If you still haven't done so, visit her blog, and have fun, she's hillarious. Leave the cheese in a mash strainer to drain well. 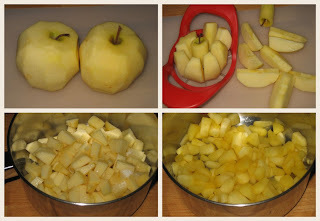 Wash, peel, core, and dice the apples. 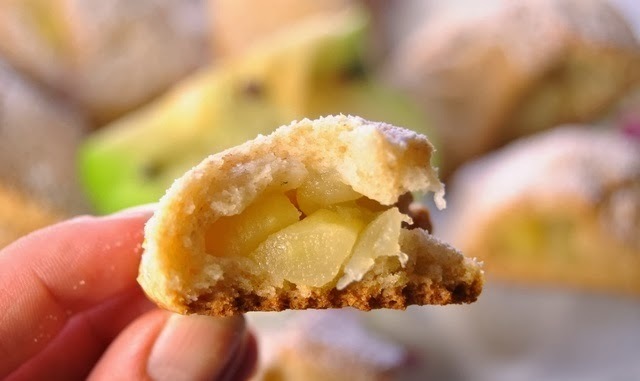 Put them in a saucepan with sugar (suit your taste and the type of apples you're using. I put about 2 tblsp), and 2-3 tablespoons of water. Cook them for 10 minutes until tender, but don't let them turn into puré. Let them cool and then add the lemon juice. 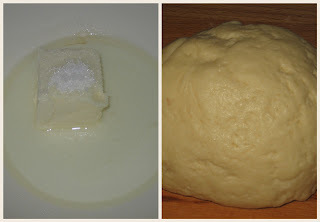 Mix all the dough ingredients: cheese, flour, milk, oil, fructose, salt. Turn onto slightly floured surface and knead shortly and lightly to form a ball. The dough should be soft, but not sticky, so if necessary add a bit more of flour. 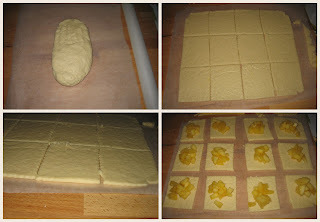 Roll out the dough between two sheets of baking paper, thin, I gues about 3-4 mm thin. I got a rectangle approx. 30x20 cm (12x10"). Cut into 12 smaller rectangles. 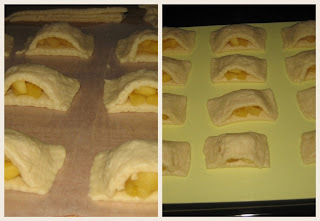 Place about 1 tablespoon of apple filling on each rectangle. Fold the rectangles sealing two sides and leaving one side open, like a pocket. Transfer on a baking sheet and bake in an oven preheated to 190°C. Ok, I went to check something on my computer, and when I got back, they were a bit overdone. So, please take them out when they are golden, not brown. Let them cool and sprinkle with some powdered sugar if you like. They are a delicious breakfast or snack time treat, with tea or coffee, or whatever you like. So, if you're still there, reading my blog, feel free to leave your comments, I'll be happy to read them all when I get back. A big hug to everyone, and have a great summer! Jabuke operite, ogulite i narežite pa kuhajte sa šećerom i 2-3 žlice vode da omekšaju (8-10 minuta). Sir dobro ocijedite, pa umijesite tijesto sa svim ostalim sastojcima (brašno + prašak za pecivo, ulje, mlijeko, fruktoza, sol). Ako nemate fruktozu stavite dvostruku količinu (100 g) običnog šećera. Istresite na malo pobrašnjenu radnu površinu pa brzo i kratko mijesite. Po potrebi dodajte malo brašno da tijesto ne bude previše ljepljivo. Razvaljajte tanko (3-4 mm) tijesto između dva komada papira za pečenje (dobit ćete pravokutnik otprilike 30x20 cm), narežite na 12 jednakih dijelova. Rasporedite nadjev na kvadratiće. Preklopite ih i stisnite dva ruba, tako da ostanu otvoreni poput džepa. Premjestite na tepsiju i pecite 15 minuta na 190°C. Lavate, sbucciate e tagliate a pezzettini le mele. Mettetele in una casseruola con lo zucchero e 2-3 cucchiai di acqua. Cuocetele per circa 10 minuti per ammorbidirle. Lasciatele raffreddare e poi aggiungete il succo di limone. Impastate tutti gli altri ingredienti (ricotta, latte, olio, farina, lievito, fruttosio e sale). Se necessario aggiungete un altro po' di farina, perché l'impasto deve risultare morbido ma non appiccicoso. Stendete la pasta tra due fogli di carta da forno (dovreste ottenere un rettangolo di 30x20 cm circa). Ritagliate 12 rettangoli più piccoli. Distribuite le mele sui rettangolini, piegateli in due sigillando i due lati, e lasciando un lato aperto (come una tasca). Trasferite su una teglia foderata con la carta da forno e cuocete nel forno preriscaldato a 190°C per 15 minuti. E con questa ricettina dolce, la vostra pasticcera pasticciona vi saluta e se na va al mare. Lasciate pure i vostri deliziosi commenti che leggerò con tanto piacere al mio ritorno. Un bacio a tutti e buona estate! 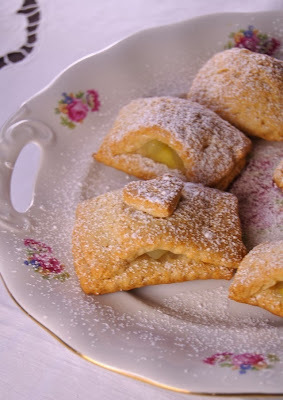 The apple pockets look fantastic....time for some afternoon tea! Have a terrific time at the beach with your family! These look so yummy!The prep doesn't look too difficult either!Have a wonderful holiday! Thanks for all of your positive thoughts on my blog too! I appreciate your input since you live right in the midst of Italian cuisine country at its best! awww...how sweet! thank you Dajana!!! and yes, I did bake them. They tasted wonderful but of course not nearly as beautiful as yours. you see, when it comes to dough, I'm all thumbs! LOL. Non esce il ripieno? sono molto sfiziosi. *Solema, no, le mele rimangono tutte dentro. *Gee, Shane, I remember now, you made them as well. Hehehe, all in one day, and you're not even the sweets guy? *Bella, it's a pleasure to comment on wonderful recipes like yours. Holy crap, those look awesome. Have fun on your vacation! These look so very delicious. I wish you the best of times on your seaside vacation. These sound awesome...apples and cheese are a rockin' combo!! Have an awesome time (I'm jealous!). The pastries look so delicious! Have a wonderful vacation!! 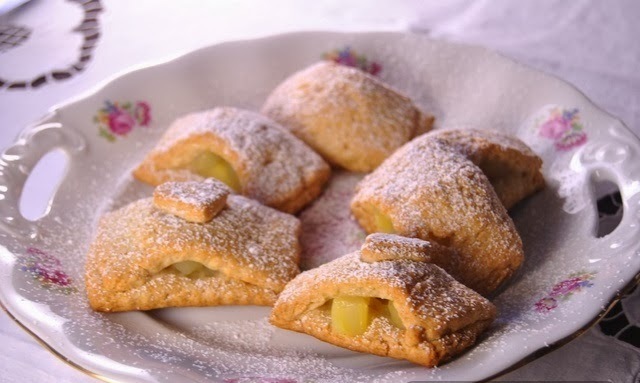 Brava Dajana, sono meravigliosi questi fagottini!!! copio, copio subito così appena rinfresca un po' li provo, baciiiiii. Ciao Dajana Che bei fagottini ! Ti auguro ottime vacanze ! 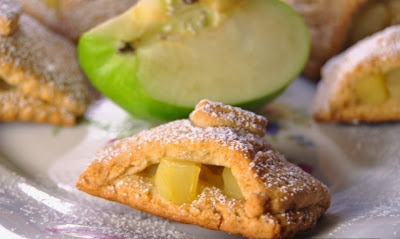 apple and cheese is great combo!1 i love this pastry :) yummm!!! love ye blog.. very interesting!! Ehila' Dajana! Ma che meravigliosi! Adesso ho un gran fame! Spero che hai avuto una favolosa vacanza! *I was thinking about different fillings but never actually tried any other but apples. Cherris sound great, apricots and peaches as well. If you try them with any other fruit, please let me know. I0'm glad you liked them. I saw some croatian recipes that use Linolade. Could you please tell me what is this thing? Is it some kind of chocolate or something???? Hi, Dajana. Thanks a lot!